In this commemoration year of five hundred years Reformation, 1517 – 2017, many tourists may still flock to Germany. They will, privately or in scheduled groups, visit the renowned Luther towns: Eisenach, Erfurt and Wittenberg. To many people the city of Torgau will be less known and that is a pity. In this beautiful settlement at the Elbe river Luther’s wife, Katarina von Bora, died. She was also buried there; a gravestone still reminds us of this special woman. The composer Johann Walther worked as choirmaster in this town. We know him from hymns like ‘Thy word, O God, declareth’. In Torgau we also find the beautiful Renaissance Hartenfels Castle, which was inhabited by Electors of Saxony favoring Luther. In this castle a chapel was built in 1544, which was the first church dedicated to Protestant worship. In this chapel we pose at the pulpit. Its decoration, designed by Luther’s friend the artist Lucas Cranach, is a wonderful summary of Luther’s ideas. In the panel at the right side of the pulpit we see the story of Jesus driving the moneychangers out of the temple and all “who were selling and buying in the temple.” Jesus was angry and said: “My house shall be called a house of prayer; but you are making it a den of robbers.” The theme of the expulsion of the moneychangers also appeared in a maliciously satirical book from 1522, the Passional Christi und Antichristi, which was illustrated by Lucas Cranach as well. In this booklet the behavior of the pope and of Jesus were compared with each other by means of images. We see for instance the pope selling indulgences. 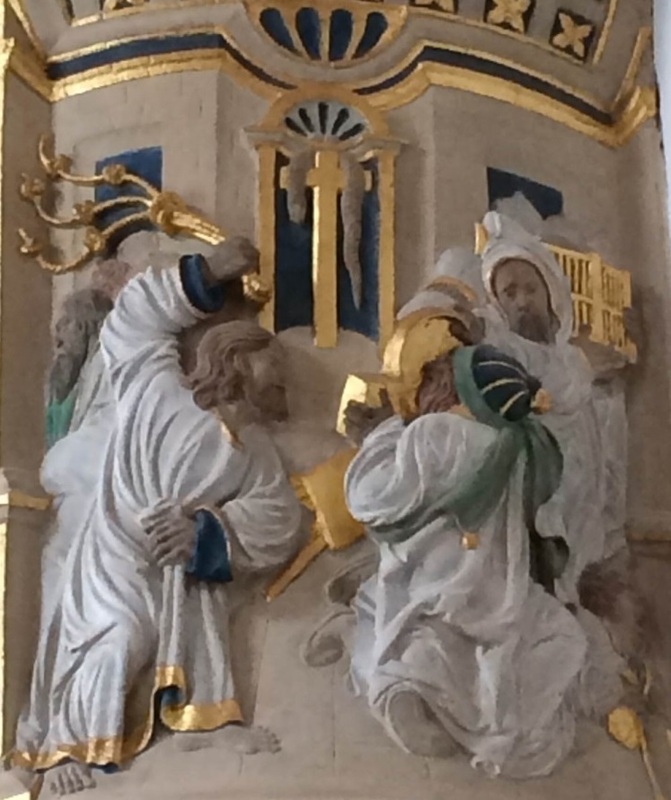 Opposite to it we see how Jesus drives the moneychangers from the temple. It was a biblical story with great actuality in a time in which Luther had taken on the struggle against the trade in indulgences, i.e. the sale of divine grace against money. It was Luther’s conviction that not by buying indulgences or by good deeds humans can be saved, but only by faith in Christ. Jesus did not condemn the sinner but forgave her generously. That is grace. In passing the clergy is presented in a bad light again. Lucas Cranach depicted this theme many times in his paintings. 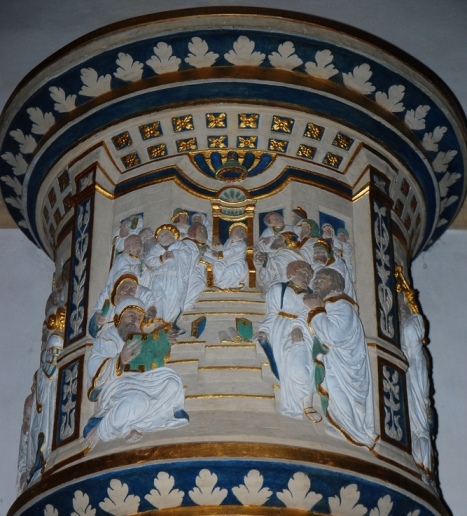 The central part of the pulpit shows the 12-year-old Jesus in the temple. This is a short story that is told in in the gospel of Luke. After the Festival of Passover the parents of Jesus travel home, but Jesus stays behind in the temple. When they discover that he is not with them, they return to Jerusalem. They find him among the teachers in the temple, listening and asking questions. The teachers are astonished by his understanding and answers. No wonder, for is he not “the Word become flesh”, as the evangelist John calls him? 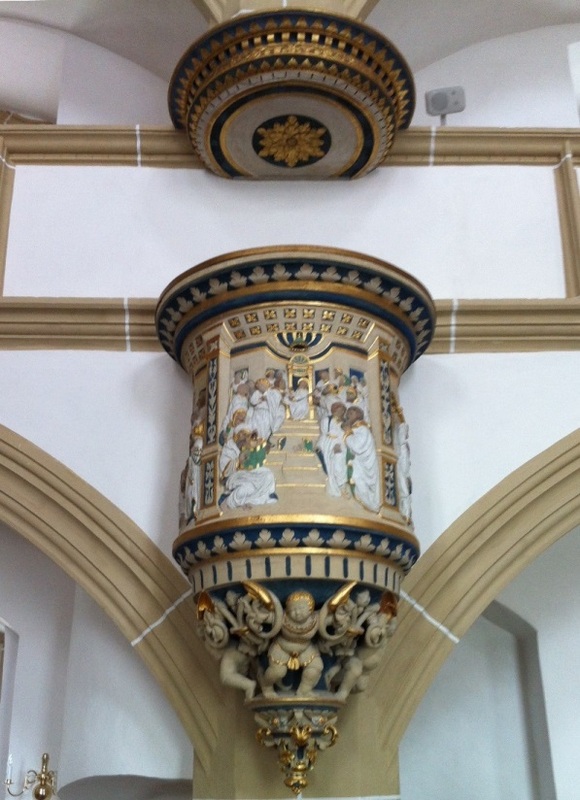 The pulpit in the castle chapel of Torgau with its well-chosen biblical themes gives a concise summary of the central points of Luther’s doctrine: only through faith: sola fide; only through grace, sola gratia; and only through the Scriptures: sola scriptura. 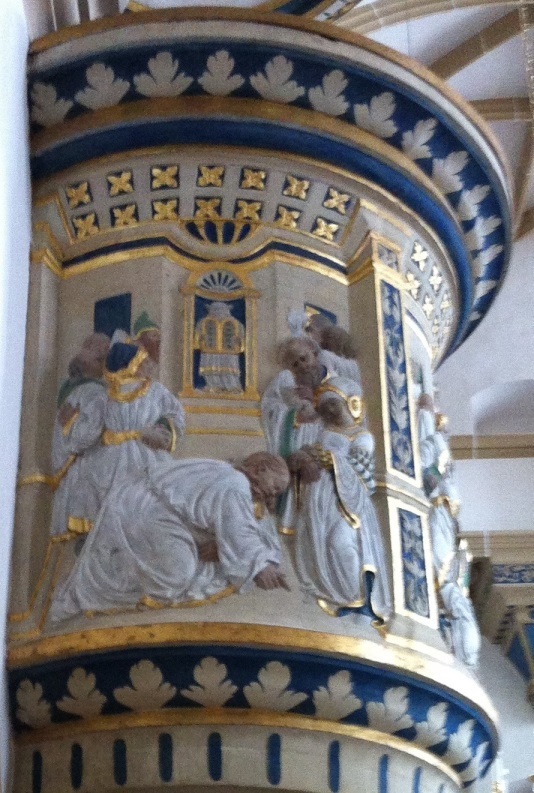 Simon Schröter after a design by Lucas Cranach the Elder: pulpit in the chapel of Hartenfels Castle in Torgau, 1544. Tanja Kootte is J.G. van Oord curator for Dutch Protestantism of Museum Catharijneconvent Utrecht.